This article is a stub. You can help improve the BRL-CAD Wiki by expanding it. 2 What license is BRL-CAD distributed under? 3 Where is the roadmap for BRL-CAD? 4 How do I start BRL-CAD? 5 What does the "BRL" in BRL-CAD mean? 6 How do you pronounce BRL-CAD? 7 How do you pronounce mged? 8 How should BRL-CAD be spelled? 9 How can I check out the Archer prototype (on Windows)? 10 How do I get a hard copy of what I'm looking at in MGED? 11 How can I fix the huge transparent yellow cursor when I run MGED? BRL-CAD is a powerful cross-platform open source solid modeling system. See here for the longer version. What license is BRL-CAD distributed under? BRL-CAD is a large system with various portions under different license but is predominantly distributed as a collective work under the v2.1 LGPL. Most of our data files and documentation are provided under a modified BSD license or are in the public domain. See our COPYING file for more details. Where is the roadmap for BRL-CAD? How do I start BRL-CAD? 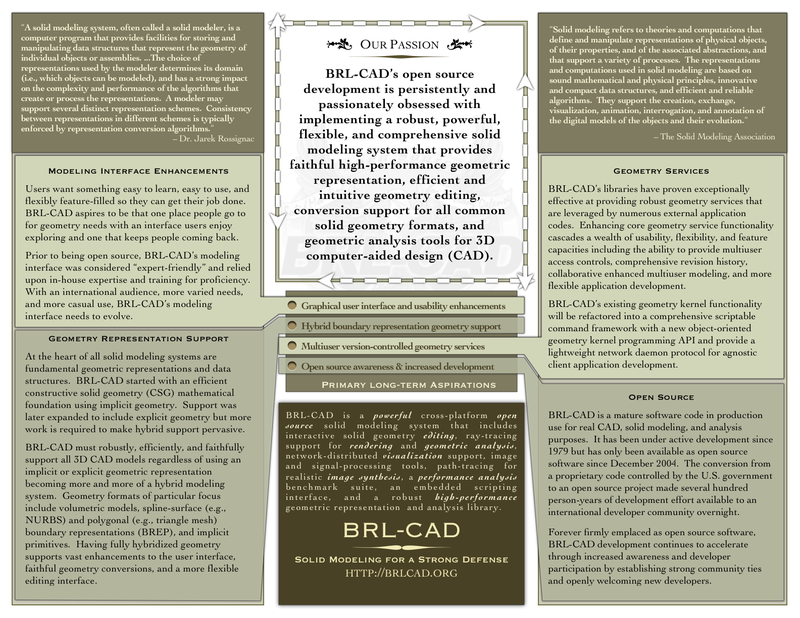 BRL-CAD is a suite of more than 400 tools and utilities. The suite of applications are intentionally designed to perform a succinct task so that they can be chained together, scripted, and expanded upon in order to provide powerful flexibility. That said, most users will be interested in using mged as a first step in getting started with BRL-CAD. Documentation on mged can be found in the share directory where BRL-CAD was installed. There is also extensive mged documentation available on the website under Documentation. Although /usr/brlcad/bin/mged works under Ubuntu as well, the alternative is to use a special BRL terminal which can be started with brlterm. In this terminal the command mged will run the program. What does the "BRL" in BRL-CAD mean? The "BRL" in BRL-CAD comes from the project's origins at the Ballistic Research Laboratory. BRL was later absorbed into the U.S. Army Research Laboratory in 1992 but BRL-CAD retained its original distinctive name and trademark heritage. How do you pronounce BRL-CAD? BRL-CAD is correctly pronounced as "be are el cad". Incorrect albeit perhaps humorous mispronunciations overheard include "burl cad", "burly cad", "brill cad", "brail cad", just "be are el" and other variations without the "cad" designation, and of course "brazilian real canadian dollars". How do you pronounce mged? According to the earliest developers, as well as the current core development team, the pronunciation is "em ged" with a hard "g" as in "get." How should BRL-CAD be spelled? The proper name of the project is "BRL-CAD", with specific importance to spell the name in uppercase and utilizing a hyphen for consistency and uniformity of name recognition. The "BRL-CAD" name should be used for all materials that will be publicly displayed or published. While it is acceptable to use the non-hyphenated and lowercase "brlcad" name for files and directories that refer to the package, e.g. brlcad-7.8.2.tar.gz will compile and install into the /usr/brlcad directory by default, the "BRL-CAD" name should be used as the official name of the project wherever possible unless technical limitations prohibit it. Similarly, the source code may utilize variations on the name due to technical limitations, but they are considered private internal use. Unacceptable variations of the project name for public documentation and articles include BRLCAD, BrlCAD, BrlCad, Brlcad, BRLcad, BrlCAD, Brl-CAD, Brl-Cad, Brl-cad, BrLcAd, etc. How can I check out the Archer prototype (on Windows)? Select one of the examples like "axis"
How do I get a hard copy of what I'm looking at in MGED? The File->Raytrace and File->Render_View->RT_Script menu options in MGED will generate a raster image of MGED's current view. The pix-png utility can be used to convert from BRL-CAD's .pix raw image file format to the .png file format, and can then be printed or embedded into other documents using other tools. Additionally, the other File->Render_View options for generating standard Plot and PostScript output files of the MGED wireframe suitable for printing. The pl-fb and fb-png tools can be used to rasterize a Plot file to the .png format. Finally, there are a variety of renderers and lighting models available in BRL-CAD that are useful for various purposes. The rt tool is the primary ray-tracer that is used for shaded view rendering. The rtedge and rthide commands are used for hidden-line renderings similar to what you'd want for generating drafting documents. rtwizard is a graphical 'wizard' tool that can be used to generate a variety of hybrid renderings. How can I fix the huge transparent yellow cursor when I run MGED? .id_0 config -cursor "xterm black"
This page was last edited on 13 June 2016, at 23:43.